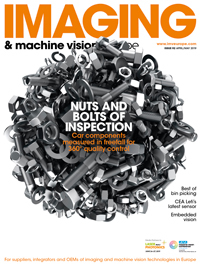 In recent years, there have been strong indications of a growing interest from machine vision users to explore new wavelengths in order to address challenges that visible light captured by traditional CMOS or CCD image sensors have been unable to solve. In particular, shortwave infrared (SWIR) detectors have emerged as a solution for specific industrial applications, such as: semiconductor inspection, since silicon is transparent above 1,100nm; photovoltaics efficiency quantification, using photo- or electroluminescence in SWIR; in-line spectroscopy for inspection and sorting of materials in agricultural, pharmaceutical or recycling; and temperature monitoring for hot process control. Within these applications, SWIR’s ability to differentiate materials thanks to their relative reflectance properties has raised a great deal of interest in the technology. Because SWIR light is absorbed by bond vibrations characteristic of organic molecules, it can reveal material composition when selecting relevant wavelengths. For example, the use of multi- or hyperspectral machine vision in SWIR has been shown to be effective to quantify sugar, acidity and water content in fruit and vegetables, and detect pesticide residues or diseases which could be harmful to consumers. Similarly, meat or fish products can be evaluated for their protein or fat content; bone residues can be clearly identified. This creates the opportunity for a fast, non-destructive and chemical-free control in product quality processes. Outside of the food industry, SWIR imaging has also stimulated interest for plastic sorting in recycling or for in-line control in the pharmaceutical or chemical industries. The major obstacle to massively deploying these systems has been the high cost of the image sensors that are required to detect SWIR light, and in particular Indium Gallium Arsenide (InGaAs) that offers a spectral response from 0.9 to 1.7µm with a high quantum efficiency of over 70 per cent. To address this trend in SWIR, meet the cost-challenge and thereby create opportunities for vision system integrators, Sofradir has developed Snake SW Tecless, a new high-performance InGaAs detector in a compact design and with a cost-efficient assembly on par with CMOS image sensors. Typical in-line inspection and sorting applications require a high frame rate. This means the integration time is short and external illumination is needed. In these conditions, the impact of any temperature-dependent dark noise is limited. Good signal-to-noise ratio can be obtained, even without cooling, thanks to the low readout noise performance of Sofradir’s Snake SW Tecless detector (30 electrons). The VGA sensor (640 x 512 pixels) also offers a frame rate of 300fps making it compatible with the speed requirements of these industrial applications. Fast and affordable SWIR detectors, such as Snake SW Tecless, are expected to help create new machine vision applications that bring even greater improvements in product quality control or increase yields across various industries. Sofradir will exhibit this new device at booth 5725 during Vision China in Shanghai. It is already available in production volumes for camera or system integration.